Chicago will always be known as an NBA town because of the Bulls, but the city also has a reputation for supplying the pro and major college programs with top-flight talent, including the upcoming NBA Draft. The city has been at the forefront of NBA talent for years with players such as Kevin Garnett, Dwyane Wade and Isiah Thomas. The NBA and the now-defunct American Basketball Association have benefited from hundreds of players who call Chicago home. According to Basketball-Reference.com, Chicago and other Illinois cities have produced 246 NBA and ABA basketball players over the years. 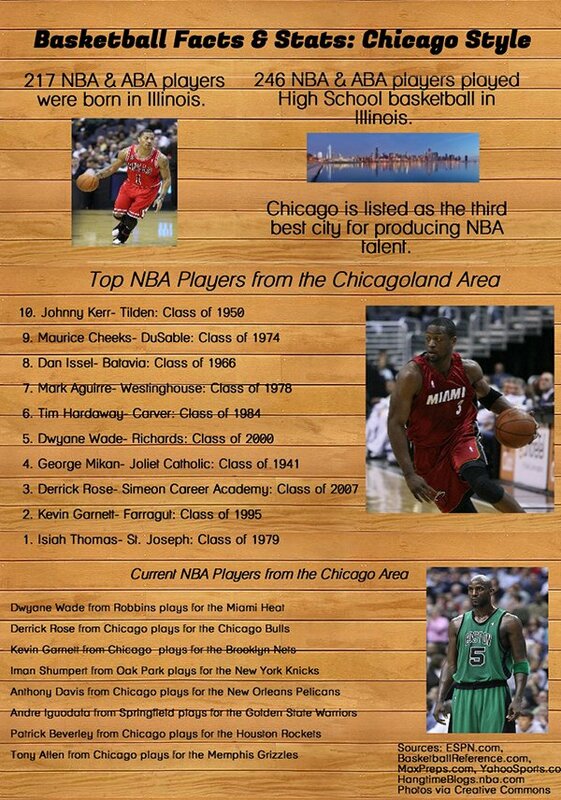 Simeon Career Academy has been at the forefront of producing NBA players in recent years with Derrick Rose, DePaul star Bobby Simmons and Nick Anderson. 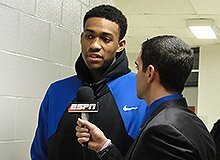 Joining them soon will be Simeon alum and Duke star Jabari Parker, who's projected as one of the top picks in the June 26 NBA draft. K.C. Johnson, who played high school basketball at Evanston High and is entering his 17th season covering the Bulls for the Chicago Tribune, says there are many factors as to why the city produces so much NBA talent. "I think there's an inherent toughness to Chicago, but the biggest reason for so much local success I think is the widespread love for the sport and the city's size," Johnson said. Duke Coach Mike Krzyzewski, who signed Parker out of Simeon, grew up in Chicago and played high school basketball at Archbishop Weber High before moving on to West Point. Krzyzewski and several NBA players have talked about their upbringing in Chicago as a factor to their success, Johnson said. "There is clearly a sense of pride and brotherhood for those who are associated with the NBA and from Chicago," he said. "Look at Coach K. He cites his upbringing here often as he coaches pros with the U.S. national team. I think those who escaped poor neighborhoods especially have an appreciation for the odds they overcame to make it big." High schools have capitalized on that talent, which translates into titles. Simeon won the IHSA Class AA State Boys’ Basketball Championships in 1984, 2006, and 2007. Simeon also won the Class 4A Championship in 2010, 2011, 2012, and 2013. Simeon has won seven state titles since 1984, and has won state titles from 2010 to 2013, which is tied for the longest run of consecutive state titles in Illinois. This school has produced many talented athletes since the school opened in 1949, and with the NBA draft approaching, it has the chance to have two No. 1 overall picks within a decade -- Rose and now possibly Parker. With Anderson, Parker, Rose and Simmons, Simeon has a solid pipeline to the NBA. But it's Maywood Proviso East that has sent the most Illinois high school players to the NBA with nine, according to Bleacher Report. Proviso's NBA alumni include Doc Rivers, Michael Finley, Dee Brown and former DePaul big man Steven Hunter. The top high school in the country for NBA talent is Oak Hill Academy in Mouth of Wilson, Va., which has produced 21 players, most notably Carmelo Anthony, Rajon Rondo, Jerry Stackhouse and Brandon Jennings. Assessing the city's talent level over the decades is difficult, Johnson said. Styles of play have changed. Picking the city's best player is impossible. His short list, in no particular order: Thomas, Wade, Cazzie Russell, Eddie Johnson. Tim Hardaway. Terry Cummings. Maurice Cheeks and Quinn Buckner. Which Chicago high schools currently have alumni on NBA rosters? Follow this StoryMap to find out. Simeon and other top Chicago basketball powers don't produce all of that talent alone. The Amateur Athletic Union (AAU) has played a big role since the 1980s. The AAU circuit is seen as a chance of opportunity for high school players to play on traveling teams at national tournaments and gain exposure in front of top college coaches. “Guys reach out to those programs because they know that constantly they are going to go out to big places to play,” Smith said. Smith said he is not the biggest fan of AAU basketball. He thinks the fast-paced game, where the players lose focus of the fundamentals they learned in high school, undermine the essential principles of winning and being together as a team. These aspects often are not emphasized during the competition season for AAU ball, high school coaches argue. Johnson said it's a combination of strong, fundamental high school coaching and the extra work in AAU that contributes heavily to the players' success at the college and pro levels. "People like Gene Pingatore and Bob Hambric are legends for a reason," he said. "I think the tradition of success from those schools demands a huge commitment. High school basketball has become far more specialized and a year-round affair with AAU ball. That helps too." Smith is aware of his players' mindsets when they join their respective AAU teams following the conclusion of the high school season. He did acknowledge that some of his players have gotten partial and full rides to colleges based off their AAU performances. His philosophy is that he wants to do what he can to get his players to go to college, so he doesn’t mind the positive experiences they could get from AAU. The AAU circuit has been a great platform for some of Chicago’s best talent. Some of the players that excelled and had great careers through AAU: Will Bynum, Shannon Brown and Eddy Curry. Some AAU teams throughout the years have been powerhouses. These teams have had some of the best players from the Chicago area play for them. Teams like Ferrari, Chicago Select, and others are know both locally and nationally as teams with the best talent. Additional reporting by Mike Reilley.